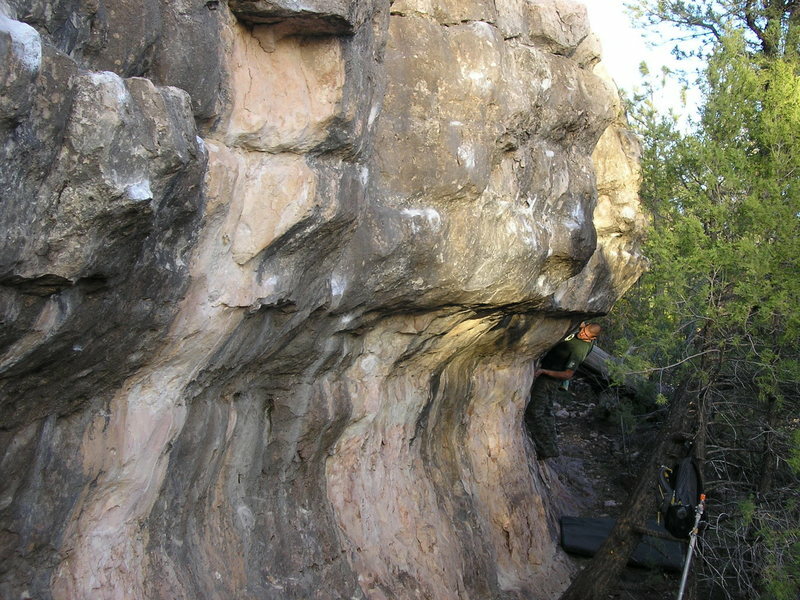 Once coined the "Land of High Bouldering" by the late Robert Drysdale, the intermittent band of limestone walls above Lower Lake Mary have over time become known simply as, The Ridge. This band runs for roughly four miles starting at the Pit, though the good stuff starts cropping up around the west end of Lower Lake Mary. The climbing is generally vertical to overhanging, with many bulge walls that will certainly capture your attention. But don't expect to find any roof problems out here. The style is technical, and it will feel more like an every mans Cherry Canyon, though it's logistically and geographically closer to Priest Draw. Though the highballs do dominate the landscape, there are also tons of shorter problems to be had. All in all, there are plenty of desperates, and a whole lot of high quality moderates. A stick brush and a broom can be valuable tools to have. From Flagstaff, find your way to Lake Mary Road and head east. JJ Schlick & Matt Grecco with an attentive spot.